You are a foreigner in a foreign land. People are going to attempt to scam you. Unless you are with a travel group and tour guide, even then, you are not going to avoid someone (children included) trying to get you one way or the other. While this may happen, it should not deter you from traveling and having an amazing time. and how to avoid it! These are some of the seven most common scams that I have encountered and ways that you can avoid them! : This scam is pretty standard. You get a taxi cab, and you realize and that there is no meter in the taxicab. If you are not paying attention, once you arrive at your destination, the cab driver will try to charge you a crazy amount for the cab ride. Or you assume that you will be paying a certain price for your ride and once you arrive at your destination it is way more than what you anticipated. as you get into your cab. Watch the meter throughout the cab ride to ensure that the price does not jump up drastically. 2) Use a service like Uber or a local ride-sharing service that uses an app that can estimate your cost and has the contact information of your driver. 3) Make sure you have verified approximately how much you should be paying to get to your destination. 4) Only get into taxicabs that have the photo and certificate of the cab driver in it. : This happened to me in Bangkok, Thailand. As you are walking towards an attraction, a local, typically a cab driver or tuk-tuk driver will tell you that the attraction is closed for the day. Then tell you that they can take you to other attractions or a different entrance for a set price. : Being well-informed is critical. If you know the hours of operation for a particular attraction, you will know for yourself whether or not an attraction, museum, etc. closed for the day. : This is a heartbreaking scam. You may see a child on the street who is disabled, injured, or just say that they are hungry or homeless. You give this child money or buy an item for them, then soon realize that they were a part of a Ring, because they pass the money along to their "handlers." Sometimes it will be a group of children that surround you to distract you while the others pickpocket you. These scams are pretty common in Europe and Asia. give money to anyone (children included) on the street or anywhere! It is unfortunate, however, if they are begging in a tourist area, likely it is something they are doing to survive (i.e., get over on tourists). : This is always an interesting one. You go to a popular attraction, and a local "volunteer" offers to take a photo of you and your group. But before they give you your camera back they will ask you for money for taking the picture for you. : Find another tour to take a group picture of you and your group. You should not have to pay anyone to take your photos. : Someone offers to sell you train tickets at a discount, or avoid the line and pay a slightly higher price. Maybe a taxi driver offers to bring you to his friend who is a local "travel agent." You learn later, the tickets they are selling are not real, and by the time you figure it out, the scammers are gone with your money. : Always, always, always buy transportation and attraction tickets from the official ticket office, website, or through your hotel/hostel. : You are staying at a hotel, and you get a call in the middle of the night from the Front Desk asking to verify your credit card details. call you in the midst of the evening asking to confirm personal details like your credit card information. Likely, they already have this information when you checked into the hotel I booked a reservation. In any case, never give that type of information over the phone. If anything, go to the Front Desk yourself if there seems to be an issue. : You are getting ALL ze attention from super, duper good looking men/women. They invite you out to a bar or club; you have a great night then boom - you get your tab and its high as hell! Even worst, you could end up drugged and robbed. Or as the urban legend would have it, you end up missing a kidney! : Play it smart 3 Stacks. Be wary of people who are extremely forward and hitting on you aggressively. Yes, you are a hottie but so is that green in your pockets they are trying to scope out! : This happened to us in Egypt. People will see you, strike up a friendly conversation, and "gift" you with something (in our case, it was a silk scarf). Once you have it, they will demand money from you and if you do not give it to them ("Damn! I thought this was a gift! "), will try to cause a scene. : Your mama told you never to take candy from strangers, right?! : A friendly local approaches you at an ATM and says they can help you avoid local bank fees. What they are trying to do is scan your ATM card with a card reader in their pockets then try to see your PIN number so they can milk your account later. You do not let people run up on you at the ATM at home, right? Do not let it happen anywhere else. Never let anyone get too close to you when you are doing any banking or financial transactions and make sure that you cover your PIN when you put it in! : Ugh! Unfortunately, we got GOT in Rio. Even though I KNEW about this scam before coming, we allowed a waiter to walk off with our credit cards (hence why I rarely use cards in non-emergency cases) at a four start restaurant. Luckily our banks caught the suspicious transactions and stopped the suspicious charges before they could go through. let anyone walk away with your cards. Ever. Outside of the States, many restaurants or stores use portable card machines that they bring to the table to run your purchases. : This is common in small restaurants, markets, and taxi cabs. You hand over a bill to an employee, who then will claim that the bill is counterfeit. You ask for the bill back, and they have switched the real bill (the one you gave them) for a counterfeit one. : Make sure you are familiar with the country’s currency and pay close attention when paying and use exact change as much as possible and avoid using large bills. : You are in a crowded area, and a thief or a gang of thieves distract you with a shove/bump and then proceed to lift your valuables from your pockets, bag, or purse. This can happen when you are swarmed and overwhelmed by several people who are shoving, while at the same time, pick your pockets. to place your passport, the majority of the money, and cards. Secondly, never put a wallet or anything of value in either your front or back pockets. Lastly, make sure to wear a cross body bag (that you wear in front) with zippers and not the one that utilizes button for closures. : You have a rental car and have your valuables and luggage in the backseat. Thieves will hang out on the corner wear red lights are long, and smash in your window, grab your things and run. I grew up hearing about this even at home. : Never leave your valuables and luggage visible, especially in the backseat of the car. Lock everything up in the trunk. When you are out and about in town, make sure to always carry your valuables with you. : Paying with local currency has always been my preferred way to buy goods and services in another country. While I do travel with a credit card that avoids foreign transaction fees, I only use these cards in an emergency. When you use credit cards to buy items in markets and select the option to pay in your home currency ( US Dollar as an example), you will pay a fee on the conversion of the currency. The catch?The exchange rate isn't calculated by the credit card issuer, but rather by technology partners through the merchant's bank. This conversion fee almost always is for the merchant, so you will end up paying between 4- 7% in a conversion fee. : Pay in local currency or use American Express. They have an outstanding Fraud Protection department, and they use a private system for converting currency so you will not get hit with the tacky fees. 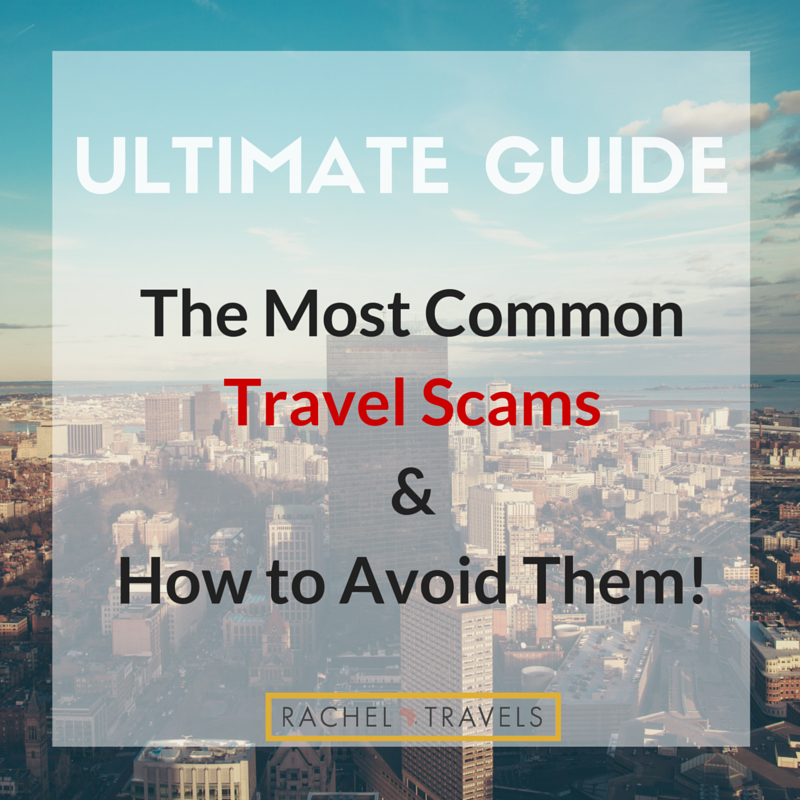 What are some scams that you have heard of or encountered while traveling?